Kee Safety is a leading global supplier of fall protection systems, guardrails and working at height safety equipment. Established in the UK in 1934, the range has expanded from our original KEE KLAMP products into a portfolio of safety equipment, all designed to separate people from hazards. 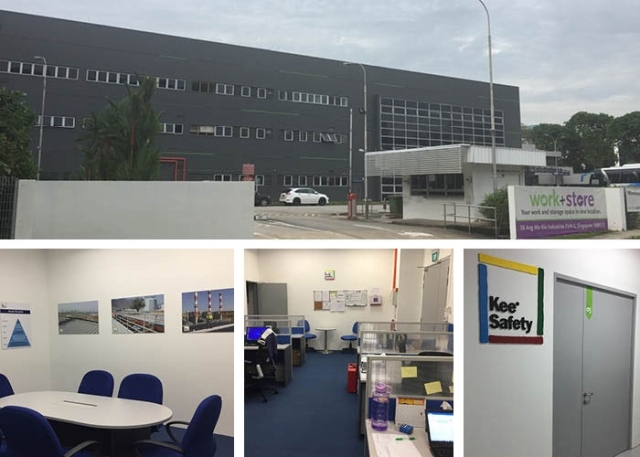 Kee Safety has offices in Canada, China, France, Germany, Ireland, Poland, Singapore, UAE & USA. Our products are also available through distributors and partners in a further 50 countries. The Singapore office was opened in February 2014 and it serves the Asia Pacific Region. Kee Safety strives to provide the highest level of safety solutions. Our products are used to protect people in many applications and countries around the globe. We serve every size customer and client, and provide solutions for every project. From code compliant rooftop safety products such as roof edge protection and horizontal life line system or safety handrails and compliant guardrails. No handrail project is too big, or safety railing too small for Kee Safety. KEE KLAMP cast iron fittings and KEE LITE lightweight aluminium fittings offer an extensive range of components which can be used to develop bespoke safety railing, handrail and guardrail solutions. KEE ACCESS components are used for handrails to comply with the requirements disability access legislation. As experts in roof top safety, we offer an extensive portfolio of roof top safety solutions. Our Fall Protection range includes KEEGUARD a free standing roof fall protection system, KEE DOME a skylight fall protection system and KEE ANCHOR a personal fall prevention system. Additionally, there is a free standing demarcation system KEE MARK, which is ideal for temporary situations. Kee Safety supplies a variety of safe access solutions designed to allow people to work safely, whether on a roof, on a raised platform or within a production environment: self-closing industrial safety gates, bespoke access platforms, platforms for working at heigjht and fragile roof access equipment. We can offer a bespoke access platform design service for both mobile and static platforms made from components and tube (both galvanised steel and aluminium options). Kee Safety also offers the versatile steelwork fixings solutions widely used in curtain walling and other secondary steelwork applications. BEAMCLAMP steel to steel connection products secure new steelwork, grating and floor plate into position; BOXBOLT an approved blind cavity fixing is used in structural steelwork where access is restricted to one side only. The KEEGUARD Roof Fall Protection System is a world leader in its field, providing a reliable permanent fall protection system that does not penetrate the roof membrane. A tested and proven counterbalance system, this modular roof guardrail system meets or exceeds prescribed fall prevention safety standards including OSHA and EU Directives. Specifically developed for skylight fall protection, KEE DOME is a free standing guardrail system which does not penetrate the roof membrane. Supported by recycled PVC weights, this product provides an easily constructed skylight barrier which can remain as a permanent fixture or be easily dismantled and moved elsewhere. The KEELINE horizontal life line system is designed for mounting onto a range of different roof types and also building structures and KEE WALK is a roof top walkway system designed to meet the test requirements of EN 516. The KEE ANCHOR dead weight man anchor system is designed for use where collective protection is not a viable option. A modular system, KEE ANCHOR has been designed to provide a safe working environment where either fall arrest or fall restraint is required. The basis of our system is the WEIGHTANKA dead weight product which is suitable for use on a number of roof surfaces. Additionally this can be used to link a horizontal safety line between numbers of base systems to which a worker can attach for safe access along a roof; this being known as our WIREANKA system. The dead weight also forms the platform from which ACCESSANKA can be attached which offers a safe portable product for rope access workers to abseil down buildings. The KEE ANCHOR product family offers a cost effective solution to working at height. Completing our Fall Protection portfolio is a range of safety eyebolts KEE IBOLT.